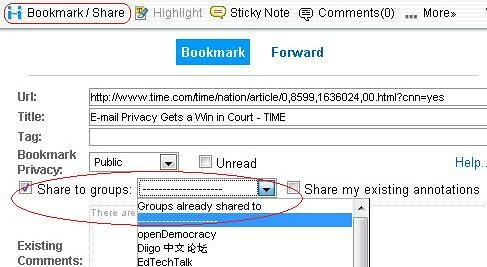 We have just updated a new diigolet that supports sharing bookmarks / annotations to your selected group(s). We recommend that you completely reinstall the Diigolet in the Tools section this time (see instruction here). Click Diigolet, after the menu drops down, usse the “Bookmark / Share” button to share to groups. I have the diigolet installed on Safari on my iMac – however I do not see the sharing options.